Even though I am not participating in Miss America this year (I have two more years to get there. Who knows, maybe I will. ), I do follow Miss America Organization, Laura Kaeppeler, Teresa Scanlan, various pageant coaches, and at least 50 of this year’s Miss America contestants. This means I get countless perspectives on all things pageants. Which is important because this week is Miss America! Preliminaries are under weigh, and awards have already been given out! The first set of preliminary winners were Miss Oklahoma, Alicia Clifton, and Miss South Carolina, Ali Rogers. 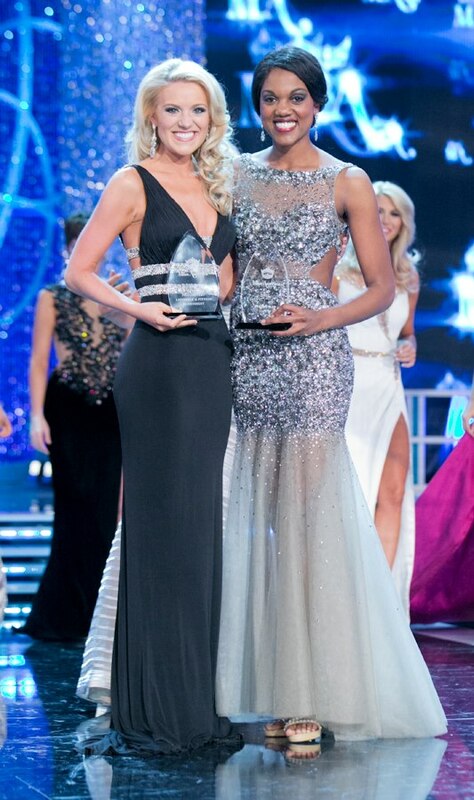 The second night of preliminaries had two more winners: Miss Maryland, Joanna Guy and Miss Illinois, Megan Ervin. On the final night, Miss North Dakota, Rosie Savageau and Miss Washington, Mandy Schendel won their preliminaries. Alicia, a tap dancer, and Joanna, a vocalist, and Rosie, a pianist, all won a $2,000 Amway Scholarship for winning the preliminary talent awards. Ali, Megan, and Mandy all won a $1,000 Amway Scholarship for rocking the Lifestyle and Fitness category. Joanna Guy & Megan Ervin. Ali Rogers was also the recipient of the Children’s Miracle Network Hospitals Miracle Maker Award, for raising the most money for CMN. I think this is an especially important award to win, because it shows you have put for time and effort to help others, instead of yourself. Another important award that is often overlooked is the “Quality of Life” Award Recipients. The winner of this has proven to make a significant steps to help better the lives of other people. Anna Laura Bryan, Miss Alabama, was this year’s winner. Joanna Guy (Maryland) Chandler Lawson (Tennessee) were runners up, as well as 4 other finalists. Additionally, Whitney Wood (Idaho) won the Fourpoints Scholarship Award. This scholarship is given to the titleholder is is best able to represent all four points of the crown: Services, Style, Success, and Scholarship. Unfortunately, Teresa Scanlan was unable to go to Las Vegas this year. She spent the Holidays back in Haiti, working with her orphanage. The day she was scheduled to board the plane, she found out she had contracted Dengue Fever, or “bone crushing fever.” from the mosquitoes. She describes it as “extreme pain all over” as well as “a terrible headache, diarrhea, nausea, trouble sleeping, no appetite, fatigue, and of course, a fever”, and that she is not allowed to travel! It couldn’t be worse timing, but it is better that she stays home and gets rest, so that it doesn’t progress to her kidneys or liver. We can only keep her in our prayers. Mallory Hytes Hagan, our New York representative, did well, of course. Here are some photos of her as she does her best and makes New York proud.